Truly a face only a mother could love: this month's featured catfish certainly is no looker. Unless, of course, your taste runs quite far from the norm even for a catfish enthusiast! For me the most attractive feature of the frogmouth catfish isn't physical, it is sheer enigmatic appeal. It is hard to think of another catfish surrounded in such a surfeit of bizarre factoids, myths, assumptions and straightforward mystery, particularly amongst aquarists. Oddly for such an interesting fish it belongs to one of the smallest catfish families. With a single genus and a meager 3 species - prior to 1983 the genus was consider monotypic (contained but one species) - the family Chacidae is tiny. By contrast there really is quite a lot of ground to cover when it comes to talking about Chaca. On the subject of "talking Chaca", this is actually the root of the generic and species name. When removed from water C. chaca makes a loud, repetitive "chaca chaca chaca" noise. Apparently C. chaca is the only frogmouth to make this noise, the other two species (C. bankanensis & C. burmensis) are silent in their alarm at being removed from the water. Fear not however, prospective Chaca owners need not pull their intended purchases from the water to determine what species they are considering. The image below shows the most reliable method of identifying C. chaca from the other two members of the genus / family. Looking at the fish close-up below, a row of numerous serrations that look like teeth (but aren't!) line the lower lip. Additionally, little growths adorn the head and body of the fish. These are only present in such numbers on C. chaca. There is a much easier way for hobbyists to tell C. chaca from C. bankanensis: the former is a chocolate brown while the latter is a brighter orange-brown. This however doesn't take into account C. burmensis, but since I haven't seen one (and don't know anyone who has) this is a useful method of differentiating the species currently imported. Believe it or not, the mouth of the Chaca above is only about ¼ open. In the instant it takes for the frogmouth catfish to ambush their prey you only get a glimpse of its cavernous mouth. Very occasionally, Chaca will yawn. If they fully open their mouth at this time the viewer is treated to the sight of an awesome gape. This terrifying portal is also used as a bizarre method of propulsion. If these fish feel trapped and seriously threatened (and, believe me, nothing less than a major threat will elicit movement) they can quickly intake a large mouthful of water and expel it from their gills to produce a jet of water that propels the fish forward and out of danger. One of the larger debates surrounding these fish centers on the use of this fearsome trapdoor of a mouth. Many authors believe that Chaca lure small fish to an early doom using the small, worm-like barbels at the side of their mouths. Some go as for as to suggest that the teethlets found on the lower lip also perform such a function (although are not mobile in the same way as the true barbels). Other aquarists, myself included, dispute this theory. Have a read of the Shane's World article for this side of the argument. My personal experience is only with young C. bankanensis in a retail environment, but these fish do not have the lip and body growths of C. chaca and bury themselves in such a way that their barbels / lures are often concealed beneath the substrate. These barbels also point down or at best horizontally - surely an adaptation for angling would benefit from being higher than the lower lip. Of all the facts and oddities surrounding all frogmouth catfish, my personal favourite is that of parallel evolution. Let us leave the frogmouths native India (etc.) behind and travel to the Amazon. A very rare import indeed from South America is Lophiosilurus alexandri. This fish is yet to claim a common name, but frogmouth pim must be in the running. It is actually very similar to its Asian counterpart. L. alexandri is a Pimelodid, a family often noted for their long barbels, yet this South American has short barbels just like Chaca. In fact the whole morphology of this South American lurker is identical to that of Chaca (if scaled up a little). Its feeding strategy appears identical too. 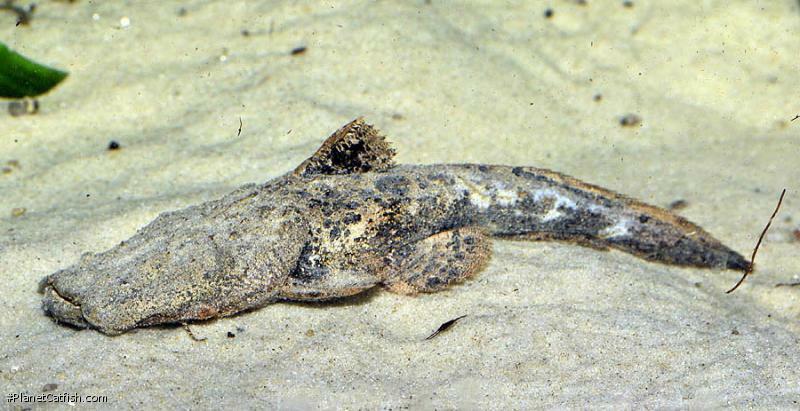 Apropos of nothing (and this is another random Chaca fact) the genus Chaca was originally assigned as Platystacus, a name now associated with the similarly inactive South American banjo catfish! In writing this article I was able to draw on the considerable experience of Shane Linder, Dinyar Lalkaka and Klaus Dreymann. Jointly they filled the gaps resulting from my inexperience with this fish. Brown B. A. & C. J. Ferraris 1988. Comparative Osteology of the Asian Catfish Family Chacidae, with the description of a New Species from Burma. American Museum Novitiates No. 2907: 1-16, figs. 1-9, tab. 1-2. Feb. 11, 1988. Sane S. R. & L. R. Bhide. 1992. The Successful Spawning of Chaca chaca. Tropical Fish Hobbyist March, 1992. Distribution Ganges / Brahmaputra drainage basin of India and Bangladesh. Feeding Baensch states that after acclimatization pellet food is accepted. I have observed hungry young C. bankanensis eating Tetra Prima (sold in the US as Tetra colorbits) soon after import. On the contrary, long time keepers of Chaca persistently try dried or even frozen food to no avail. Perhaps only young fish will learn to accept \'\'alternative\'\' foods. Either way, a Chaca keeper should be prepared to supply live fish on a regular basis. Compatibility An irrepressible predator of small, especially bottom feeding fishes. Fast moving, surface dwelling fishes in tall tank (15''+) are unmolested. That said, anything that comes within range of a hungry Chaca's mouth will rarely survive. In my opinion, one for the species tank. Suggested Tankmates See compatibility section. Diet consisted of tubifex, shrimp, small fishes, earthworms and chopped beef heart. A group of 4 fish were kept in a 36 x 18 x 18 bare tank containing a 8'' x 3'' diameter pipe. Spawning occurs in the pipe with all other fish outside. A single (probably male) fish remained to guard the eggs, these hatched 3 days later. Parental care was not observed, yet neither was predation. 10 days after the eggs were laid the fry became free swimming. The next day they began feeding on newly hatched brineshrimp and sifted daphnia. Nearly 400 fry were raised to 1.5''. They developed steadily and uniformly among the brood.